Based on the song [The Lawyer and the Cow] recorded from Beth Bond, of Blackpool, Lancashire, by Nick & Molly Dow in 1985, and included a year later on their cassette of traditional singers from the Fylde coast, Fleetwood Mashers [Old House Music OHC 105]. I've never heard the song anywhere else but Beth Bond (described as being of “late middle age” on the cassette notes) remembers seeing a picture illustrating the song in a pub in Garstang, where she was brought up. 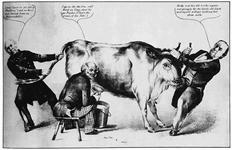 I've also been told that the farmers pulling at the cow was a popular subject for the small china figures known as “fairings”—because you'd buy them as a souvenir from the fair—something that the better brought up amongst us have been singing about for years in Oh, Dear, What Can the Matter Be? They both did wish to take it home, but couldn't agree somehow. But to see how they carried on that day, you'd say t'was a disgrace. Whilst the lawyer kept a-milking of the cow. Said Farmer Jones, “Now make no bones, that cow belongs to me. We bought the cow between us, but Jones had no money to pay. He said he'd give me an I.O.U. but that's no use to me. They cursed and shouted, scant and swore, till all their money was lost. And I'm sorry to say, that they neither could pay, so the lawyer slayed the cow. See also the Mudcat Café thread The Lawyer – 2 Farmers – 1 Cow.